Can you really charge more for a home if it has a killer view? How much is a view really worth? A home with a fabulous view is hard for a buyer to resist, but are they willing to pay more for it? Maybe, but the real question is how much more? Real estate appraisers and analysts study home values to determine fair market prices and what someone will pay, but really, the true value is what somebody will pay for pretty much anything. If somebody will pay a high price, that's what it's valued, regardless of whether or not someone else will pay that price. Views are actually quite difficult to value. It's somewhat subjective. A view to one person may not be as much of value as to another. But, this could go for just about any feature in a home. Buyers that could care less on the size of the kitchen may not pay more for a larger, more chef designed type of kitchen. A good view is always a decent selling point when it comes to the home but buyers will have plenty of other requirements in mind, the view just might be the icing on the cake. How big the home is, square footage, number of bedrooms, or location may play more of a factor with their decision rather than the view. The house may be falling down but offers a killer view. Related Post: Why do some homes sell faster than others? Of course, a home that faces a beautiful view of the water, mountains, or just an expansive view is, of course, more appealing than a brick wall or staring at someone else's house. It will naturally add a little more weight to the home's value. A study in 1994 was conducted to determine the value of a view in the house, isolating this factor from other things that could influence the price such as the size, age, and location. 14% of those homes were considered to have good views and the study concluded that this feature increases the home's value by about 8%. When we're talking about condominiums, unobstructed views at lower levels of elevation can increase the value of a home up to 2 1/2% while rooftop decks, specifically in condominium buildings with higher elevation, can increase the value up to 5%. Related Post: Do I Have to Accept a Full Price Offer? Then it comes down to what you can actually see. Waterfront views from a distance may have a lower value than if you close enough to see the beach and incoming waves. Putting a dollar amount on a view is extremely difficult and sometimes almost impossible to specifically nail down, even if there are comparable sales in the area. A peekaboo view, meaning just a partial view versus a panoramic view, offers only a glimpse of what may be visible from another home in the neighborhood. This also means that buildings, trees, or other obstacles take up 50% or more of a landscape in the partial view. Premier views have a minimal obstruction and are usually visible from several rooms of the house. Panoramic views offer an impressive sight all around the house and therefore bring the highest value. So how do you price your home with a view? For a home on the ground with an unobstructed view of an open space or a park, the homeowner could add 5% to 10% to the value. 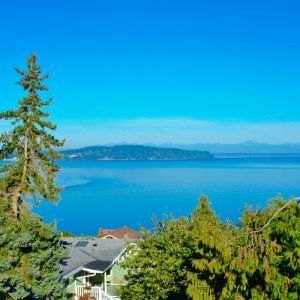 For a home slightly on a hill with a partially obstructed Waterview, the price could increase by 10% to 30%. A similar home with an unobstructed view could increase the price by 30% to 50%. A home on a hill with an unobstructed cityscape or open space view could increase the house 50% to 75%. A house on a hill, with a stunning, panoramic, unobstructed view of a large lake, ocean, or mountains can be one of the most prized views increasing a home nearly 100%. This means that if the same home had unobstructed or no view in a different location, it may be half of what it could be worth given a stunning view. Now, that's getting pretty optimistic, but again, the value is really what someone will pay for it. If you don't have the right buyer come through the door, or at least one that's interested in a view, you may not be able to get the increased value. The key is to use a real estate agent that can help you determine if the home is priced correctly. If an agent is familiar with the buyers in that area, they may be able to help you price the home correctly including with an increased value for the view. If a real estate agent is only counting on the view and disregarding other issues such as damage to the house, or issues with it, they may be disappointed. So, homes with a view will typically sell for a higher price than a similar home without a view. The determining factor is the type of view and of course, the condition of the home.